DeMersseman Jensen Tellinghuisen & Huffman, LLP, serves local, regional and national clients in a wide range of legal practice areas. As a leading small business oriented law firm in the Rapid City legal community since 1955, our firm has been the go-to legal counsel for individuals, families, businesses and investors who need quality representation. We are a result-driven legal team with decades of experience. Each of our attorneys has the skill to handle a case alone from start to finish, but as a team we bring even deeper insight and strategy to the table. When you contact us, you will receive reliable and cost-effective guidance from truly adept professionals. Give us a call today to set up an appointment. Many legal issues arise out of adversarial situations, like divorces, contract disputes and financial conflicts. Our goal is to educate our clients in these situations and help them see the solutions rather than just the personal and emotional challenges. By shifting focus to what is realistic, we can help our clients find more efficient resolutions at a cost-effective rate. We are powerful litigators who know that litigation is not always the answer. Learn more about your options in family law, criminal defense, estate planning, real estate and more. Starting about 30 years ago we determined that our good clients needed representation in our state capital during the legislative session. Today former South Dakota Attorney General, Roger Tellinghuisen goes to Pierre every winter to lobby for our clients positions. We learned that the same skills that make a good lobbyist would apply to mediation and Tellinghuisen has recently completed a weeklong mediation course and has been certified as a MEDIATOR and is going to use his extensive litigation, business expertise and lobbying skills to assist other professionals in resolving their disputes without spending years in court. Many people have a difficult time thinking about the future. With all its uncertainties, it can be hard to know what decisions will best protect you in the event of the unexpected. We know that estate planning and probate can be challenging topics. Education and information are our focus in every client interaction. We want you to feel comfortable coming to us with your questions and having a candid conversation about what will best serve your needs. Founded as a firm to provide exceptional legal services for a fair rate and our lawyers have provided the business community or Rapid City and surrounding areas with a full range of guidance for all types of business's since 1955. The firm has been selected for Best Lawyers in America and several lawyers have been selected for individual categories, including Corporate Law, Real Estate, Banking Law, Estate Planning. In reality corporate and commercial law has been the expertise of DeMerssemen Jensen for over 60 years. 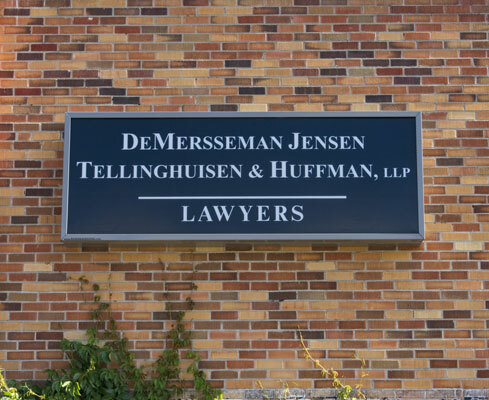 At DeMerssemen Jensen Tellinghuisen & Huffman, LLP, we represent individuals who have been investigated, arrested or accused of crimes throughout Rapid City and all of South Dakota. Our firm's legal team offers a caliber of representation not found at many other law firms, with every attorney offering decades of experience and a commitment to personal service. Our lawyers have extensive experience in all areas of real estate including acquisition, disposition, developing and structuring ownership for the clients best advantage. We know what our clients want and that is be assured thatevery detail is handled with personal attention. We offer experienced real estate law and litigation representation for clients throughout Rapid City and western South Dakota. Use the form below to contact us regarding your legal enquiry. Please be as detailed as possible. To help us best service you, we recommend that you first describe the issue you’re having before telling us what you want to achieve. You may also email or call us to make an appointment.